Lips without lipstick are like cake without frosting. You can put on a flawless makeup, but your look will still be incomplete without lipstick. From matte to glossy and sheer to vibrant colours, there are so many type of lipsticks; and at times, it can be very difficult to choose. For me, I would prefer colours that can be used for both day and night, and with a matte or velvety finish. 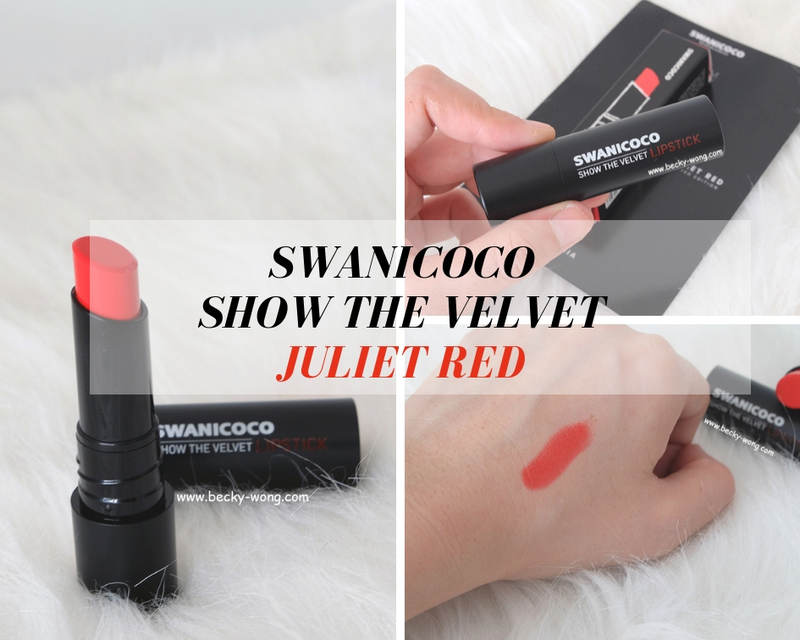 One of the many brands that I'm currently using is the Swanicoco Show The Velvet Lipstick in Juliet Red. Swanicoco started off its business by creating naturally fermented soaps, using medicinal herbs that have been carefully selected and boiled. Currently, they are the top natural cosmetics company in Korea. Using the same philosophy as their soap making, they put foremost priority on obtaining high--quality ingredients, engage in ceaseless bio development research to create a natural bio system, and continue to work hard in providing safe and healthy natural cosmetics for the skin. 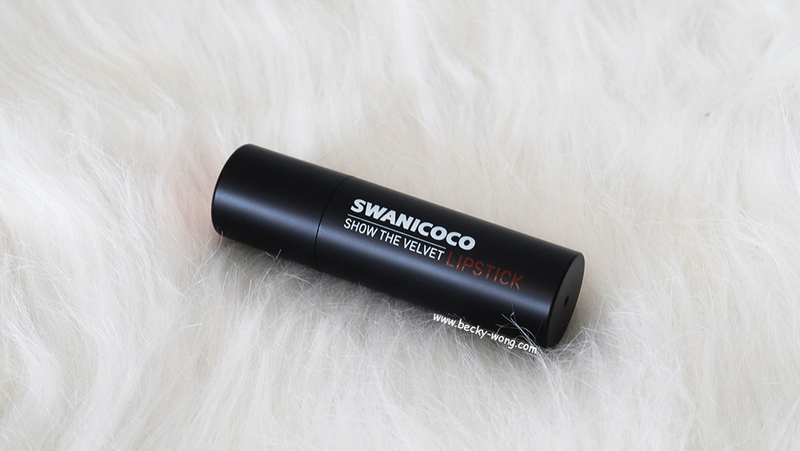 One of their products is the Show The Velvet Lipstick. 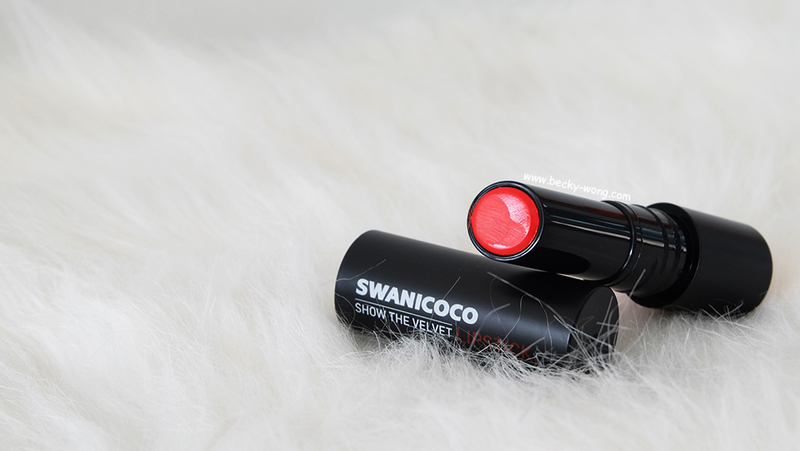 In conjunction with their collaboration with 50 Gram, Swanicoco has recently launched a limited edition Show The Velvet Lipstick (Black Edition) in Juliet Red. 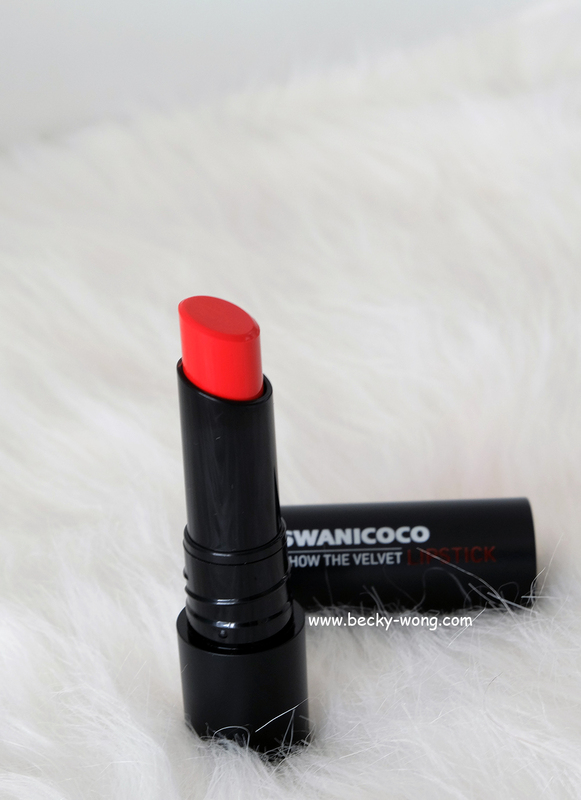 Swanicoco Show The Velvet Lipsticks have pretty vibrant shades with a velvety finish. The lipsticks contain moisturizing ingredients such as carnuba wax and natural oils which keeps the lips soft and moisturized. 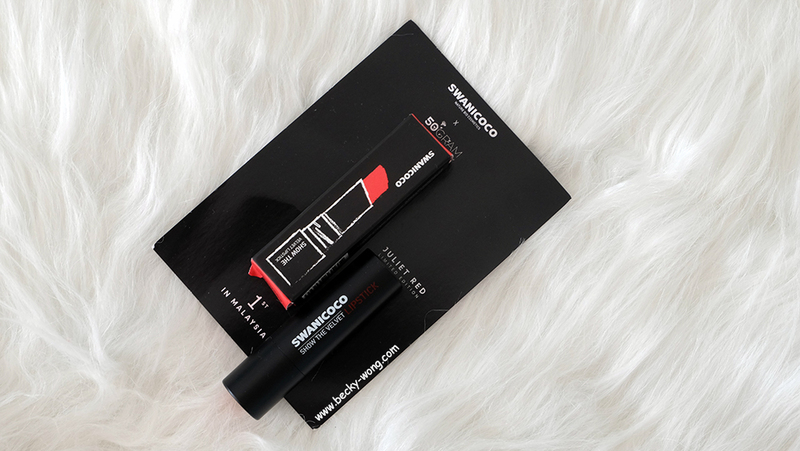 I like the packaging of the lipstick - black sturdy plastic casing with a smooth matte finishing. Unlike many lipsticks, this is a twist-open packaging. Meaning you don't need to worry the cap will fall off on its own and create unnecessary mess in your bag. There are a total of 3 shades - Pink Blossom, Shine Orange, and Juliet Red; and the one I've gotten is Juliet Red. This is how Juliet Red looks like - bold fiery red colour with a hint of orange. I don't usually wear red or fiery red colours, as I find them to be a little tough to pull off, especially during the day. But, I'm pretty excited to see how Juliet Red is. The lipstick glides on smoothly. It is super creamy and very pigmented. As you can see from the swatch, the orange tone is quite obvious too. 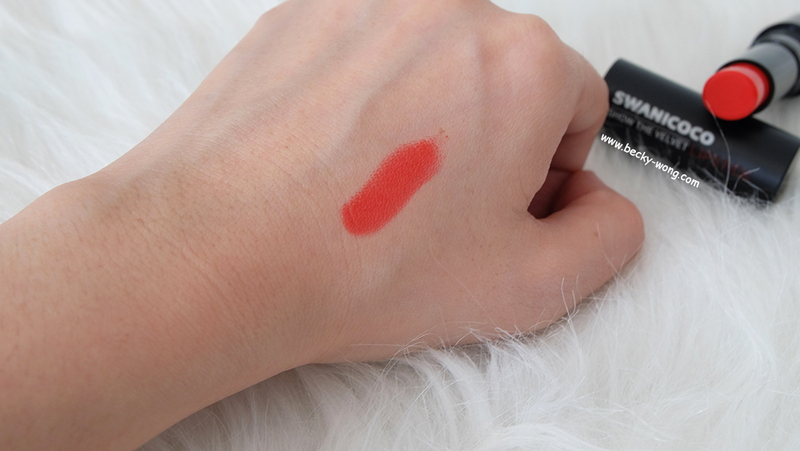 The colour is really bold and vibrant with one single swatch, so personally I would lightly dab the lipsticks onto the lips, rather than gliding it all over the lips. On the other hand, the lipstick is not 100% kiss-proof, as you'll still get a little bit of transfer from it. 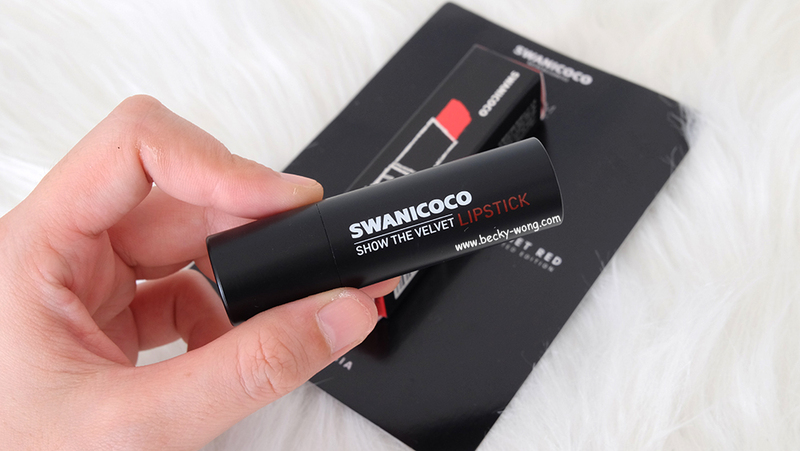 Overall, from the packaging to the texture of the lipstick, I really do think Swanicoco Show The Velvet Lipstick is a good haul. 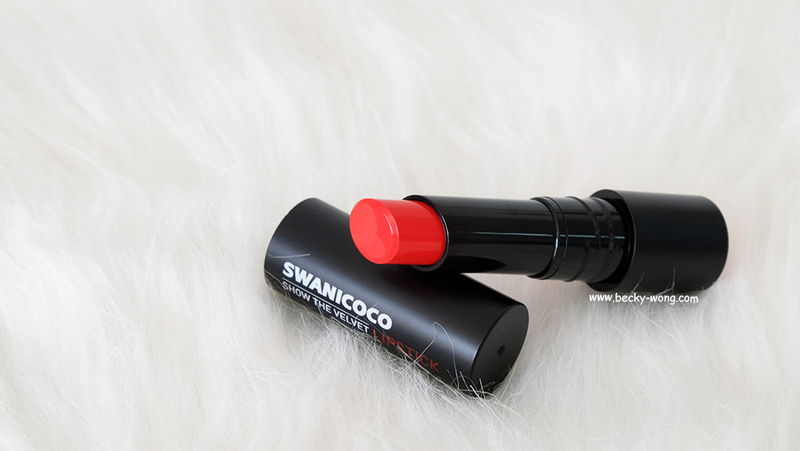 Although, some might argue the price RM 88.90 for a lipstick is quite steep, but considering this is a LIMITED EDITION product, I'd say the lipstick is still affordable.